Whenever I go to a Chifa with my Mom and Dad, we usually start with a Wantan soup, and then debate on Arroz Chaufa or stir fried noodles, but there is one dish that we always get — Steamed Fish. 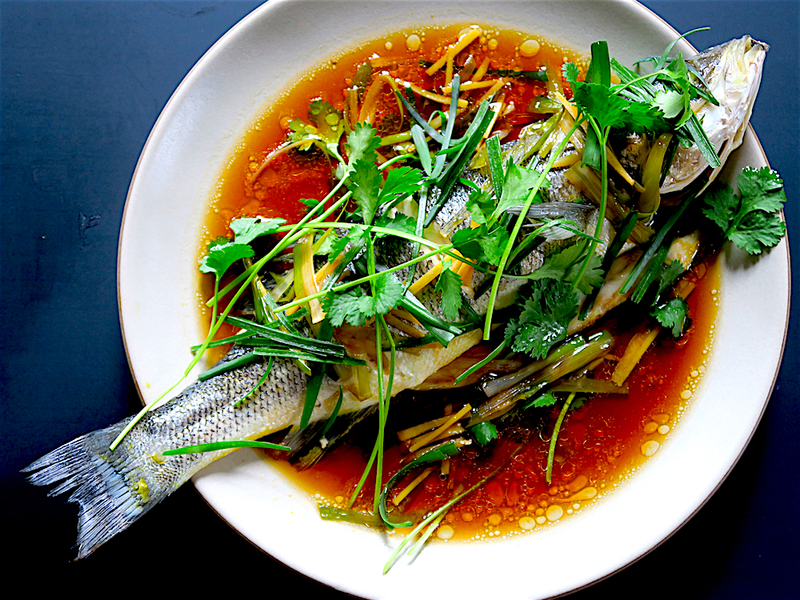 By far, that is my Mom’s favorite dish, and this is my version, a Chifa, or Chinese-Peruvian, whole steamed fish with a hint of aji amarillo heat, covered in a savory sauce made with soy, sesame oil, ginger, and scallions. Here’s what you need to do to get your Chifa flavors happening in your kitchen in the New Year. In addition to the ingredients below, you’ll need a deep skillet with a cover and at least 12″ in diameter to hold a whole fish. To test for doneness, use a fork to break off a piece of the fish near the head, if the meat falls off easily, the fish is done. After plating, use a fork and a spoon to separate the fish meat from the bones. Scoop the sauce over the fish meat, and serve with a side of steamed rice.